New Airtel Recharge plan of Rs. 398 - Launched for beating the Reliance Jio, here what will you get? 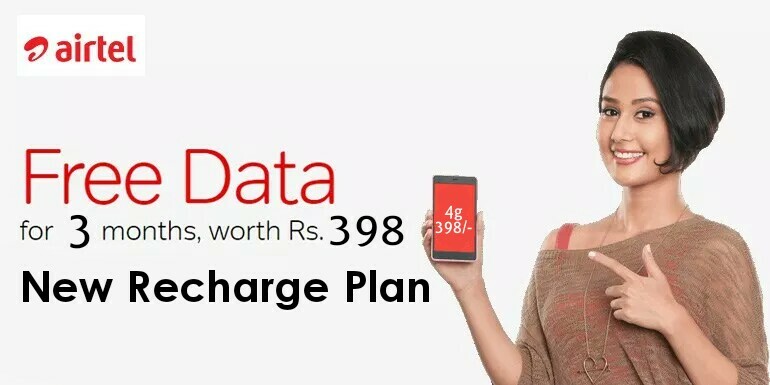 HomeUnlimited Data PackNew Airtel Recharge plan of Rs. 398 - Launched for beating the Reliance Jio, here what will you get? Airtel has launched and rolled out a new airtel recharge pack for Indian users in its lineup to take on and beat the fast-growing Reliance Jio in the aggressive Indian telecom market. here i will give a full details about new recharge olan of airtel and i will compare with Jio and Vodafone, i also give you method to activate the new plan in easiest way. so read this article till last. in the last post we have discussed about Getting the huge cashback in Airtel Recharge. and now we are going to know about airtel's new surprise. After Reliance Jio, Airtel aslo giving lots of data pack with unlimited calling to their user to stay with airte. Day by day Jio launching new plan where Airtel also rolling out many recharge plan to beat the Jio. Now Airtel has launched and rolled out a new airtel recharge pack for Indian users in its lineup to take on and beat the fast-growing Reliance Jio in the aggressive Indian telecom market.The new Airtel Rs. 398 plan offers 1.5GB of data with unlimited voice calling benefits to compete with Vodafone and Jio's existing plans in India. before its Airtel was giving 1GB data with 100 minutes of calling in a day.. but now its plan has been changed. The new Airtel recharge plan is seen to offer daily data and unlimited voice calls for a validity period of 70 days. The Rs. 398 recharge pack competes with Jio's plan of the same value. As mentioned, the validity period of the new recharge plan is 70 days. It is worth noting that the voice calling benefits offered by Airtel does not come with daily or weekly FUP limits. The new recharge pack was first reported by TelecomTalk. So these type of benefits you will receive if you recharge with Rs. 398. How to activate the New airtel recharge plan in you number? You are reading this article means you are a airtel user. so if you want to activate the new recharge plan of airtel then you can do it by both offline and online. You can also activate this plan if you have more the Rs 398 in your main balance. How to recharge airtel number offline ? How to recharge airtel number online? there are many service providers available to recharge any kind of SIM. like paytm, mobikwik, freecharge, oxygen wallet etc you can also recharge airtel number online by visiting airtel's official website. In this post i will give you method to recharge Airtel number online by paytm. and in the next post I'll cover all the service providers. I hope you loved Airtel Recharge of Rs. 398 - Launched for beating the Reliance Jio thanks for reading.... Now its time to shouting about this offer. Share this post in facebook WhatsApp or where you want and let the people know about this offer.